Maribor Puppet Theater's International Puppet Festival in Maribor is one of my favorite events and is connected with such a beautiful memories. 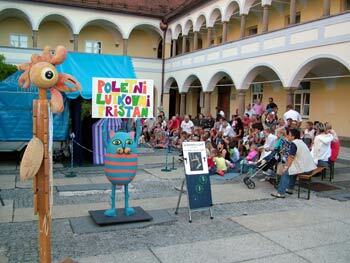 There are countless performances which I saw in Maribor Puppet Theater and at the Summer Puppet Pier during my studies. Now I am coming back every year with my daughter who adores puppets and their magical world. 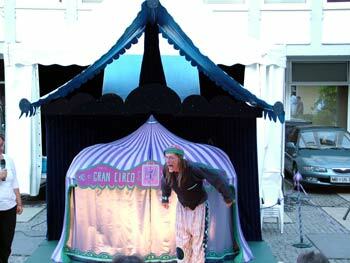 We normally try to see as many puppet performances as possible but holidays are always too short. International Puppet Festival in Maribor is a great international event for everybody who likes puppets and their magical world. It happens every summer (July, August, September) and is held on three different stages around the city (stage Rotovz square, Puppet Theater Maribor and Slovenian National Theater Maribor). The performers come from Slovenia and abroad so the children are addressed in different languages and at the same time with a single universal puppet language. The festival has become renowned not only in Maribor and Slovenia but also abroad. All the performances are judged with golden stars by children's jury. The best performance with the highest number of stars is presented with the so called CAT FROM THE SACK award. The professional jury is then responsible for selecting the best Slovenian performance. 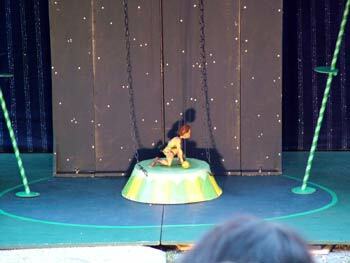 During our summer holidays in 2008 we visited Summer Puppet Pier again. You just can't miss the little puppet stage on Rotovz square. Entry is free for all so the only thing you need to do is enjoy the show. My daughter (and me as well) were delighted with Marionetas en libertad from Vernix, France and their performance GRAN CIRCO DE LILIPUT. She had never seen such a small marionettes before, so she was really surprised when she saw their "tiny" circus and acrobats in their Liliput land. Puppet stage on Rotovz square. 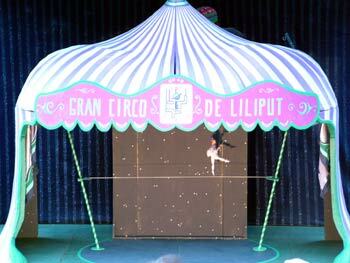 performance: GRAN CIRCO DE LILIPUT. Maribor Puppet Theater is a very well known place not only in the city and Slovenia but also far beyond Slovenian borders. It's located at the Rotovz square (Rotovski trg) in the same building that houses one of Maribor libraries. The theatre with only 144 seats is far too small (and too old) for all children and their parents who want to visit the magic world of puppets. After many years of desperate search for funding the theater won the battle and the new puppet theater is currently under construction. Established in 1974, the 17 members Maribor Puppet Theater produces four new shows each year involving more than 400 performances with 67.700 spectators. They perform almost every Sunday morning and all year round. The ticket for a show costs $4.5 or €3. They perform also in German, English and Spanish.